So many beautiful and interesting tie fabrics! I sewed together some lengths of tie fabric and then stitched a tube wide enough to fit these plastic Madrid Gras beads inside. 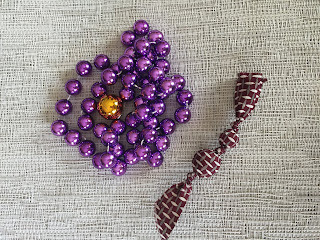 After inserting a bead I tied a knot and just kept going. 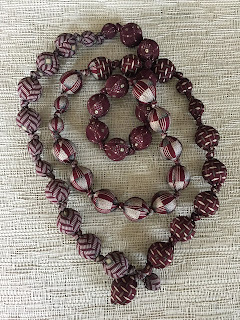 Large and lightweight jewelry, my motto! I’m taking a Creative Clothing class (again) with Lorraine Torrence, always a fun experience. 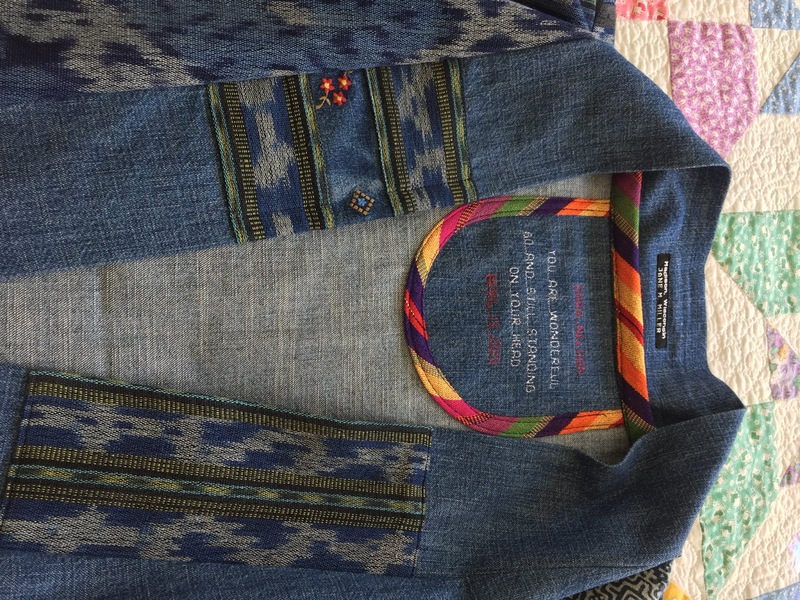 The assignment was to recycle or reuse a garment or fabric into something new. 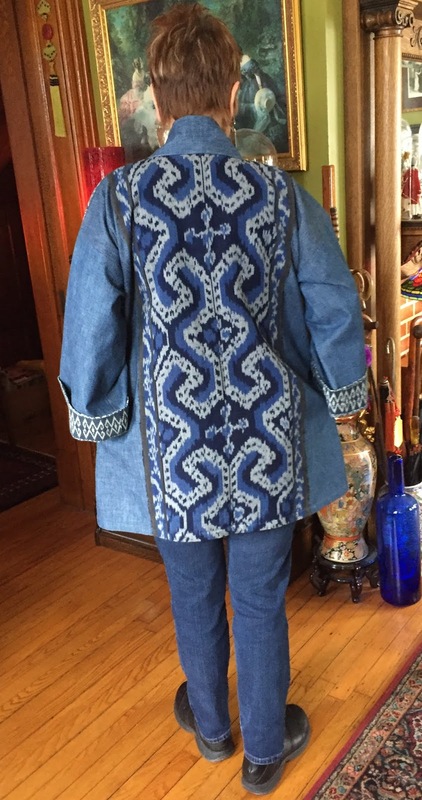 I was interested in trying out Sandra Betzina’s new kimono pattern, Vogue1610, so I decided to use it for my project. 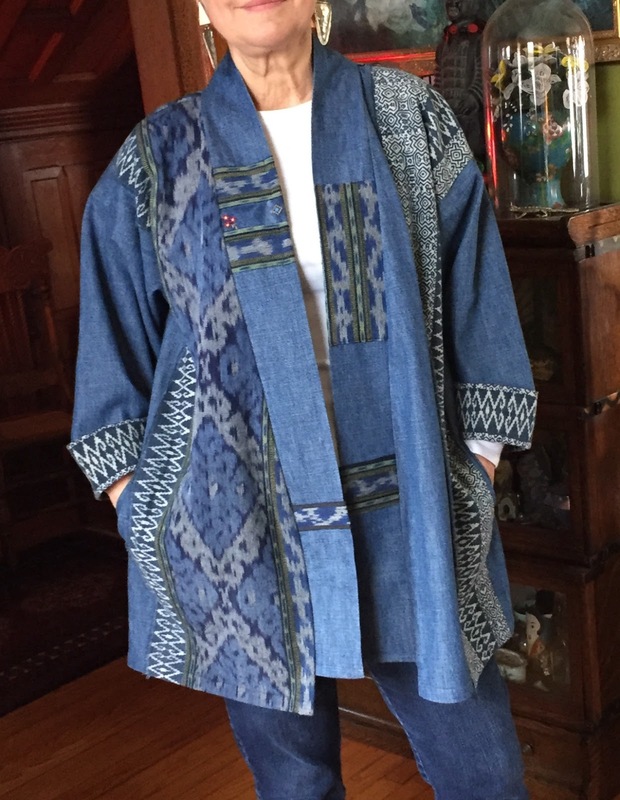 The base fabric for the kimono was a denim curtain that I bought at the Stoughton St. Vincent store known for their amazing textile sale in the spring. I embellished it with various textiles I have collected along the way, Ikat runners from Art Gheko on Monroe Street and some hand-woven indigo hill tribe batik fabric from Ginger Blossom in Richmond Illinois. 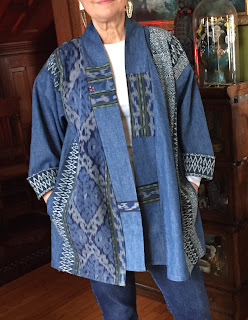 I made this kimono as a 60th birthday gift for my amazing sister who can still stand on her head, among other things. 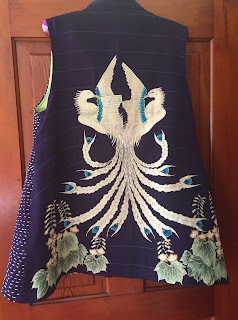 Our equally amazing Mother passed away recently so I wanted to include a small embroidery detail from one of her favorite dresses in the front band. 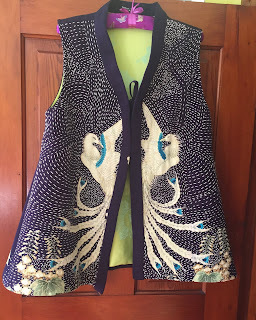 My neighbor gifted me with an old kimono which I decided to turn into a vest. 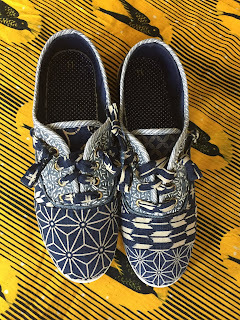 I backed the kimono fabric with flannel and then used white Sashiko thread to stitch the two together. The vest was lined with an old tablecloth. It’s a nice warm garment for our freezing Wisconsin temps! 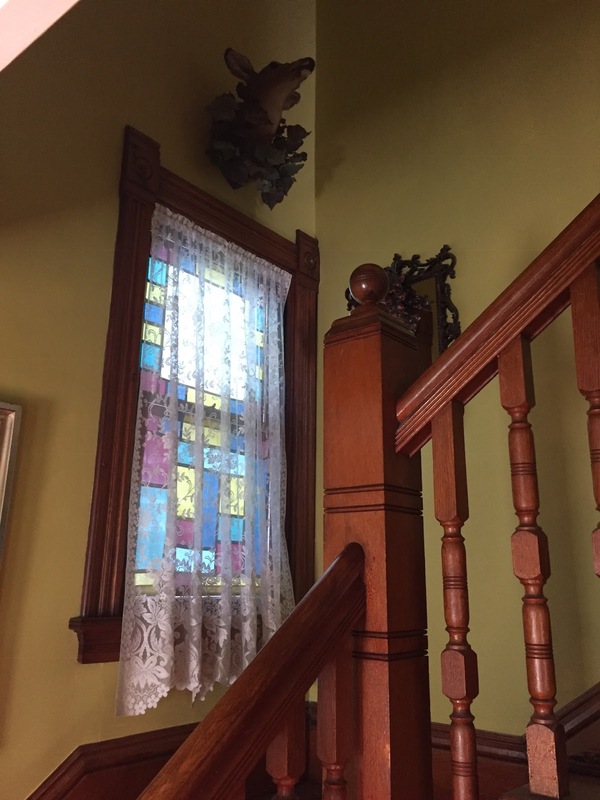 I wanted to make a window covering for our staircase hallway. 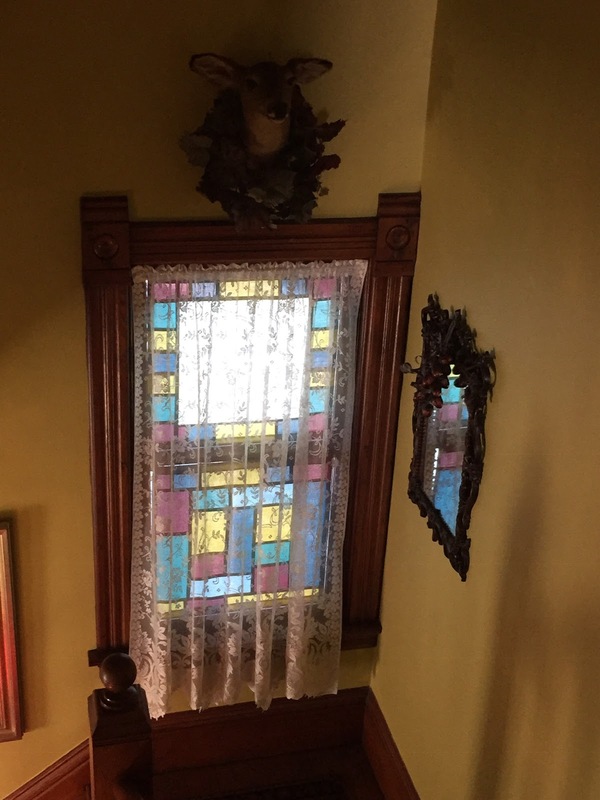 We are very close to our neighbors and I didn’t want to see their house through my window so I made this two part pojagi window covering. To complete the illusion I covered it with a lace curtain, otherwise it’s too obvious, at least to me, that it’s fabric. I used a lightweight shot cotton fabric which has a lovely transparency without being able to see through it. 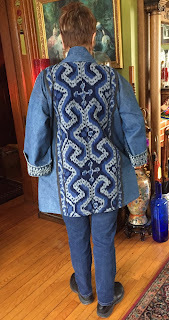 I used pojagi style stitching which finishes both sides (see photos) so that both sides are finished off. 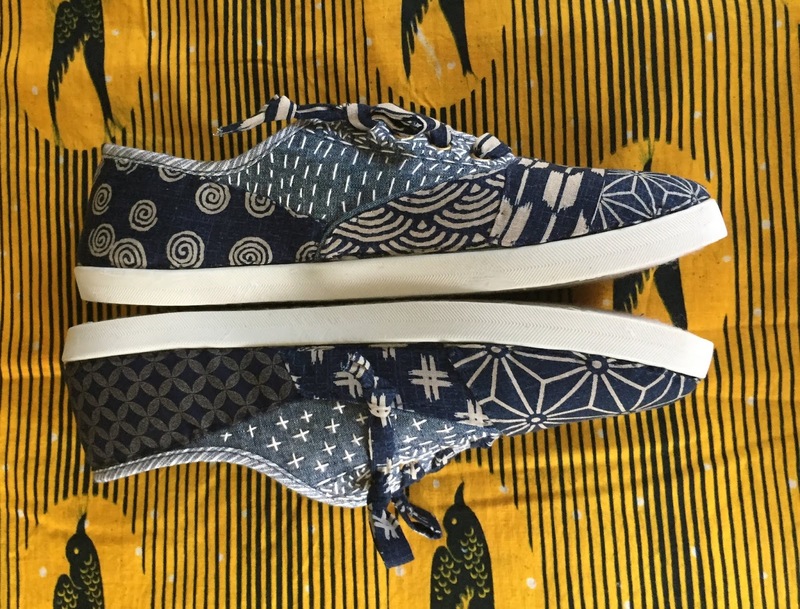 For our first assignment for Lorraine Torrence’s Creative Clothing Class this fall I chose to decorate some shoes I found at St. Vincent’s, a pair of laced tennis shoes. 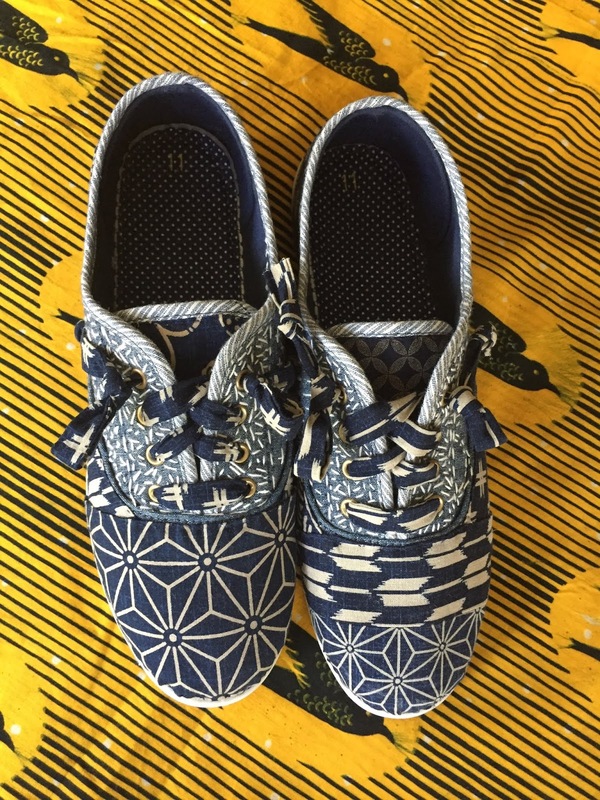 I used indigo fabric scraps sewn onto the shoes to decorate them. Luckily I was able to stitch through the shoe fabric using both a straight and curved needle. 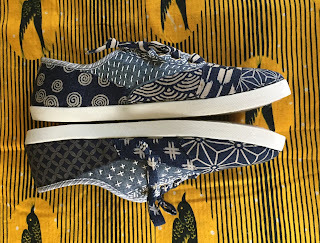 I used Sashiko thread to stitch patterns on the top of the shoes and made shoestrings of the fabric. Another niece is getting married and this time I offered to make the ring bearer pillow. 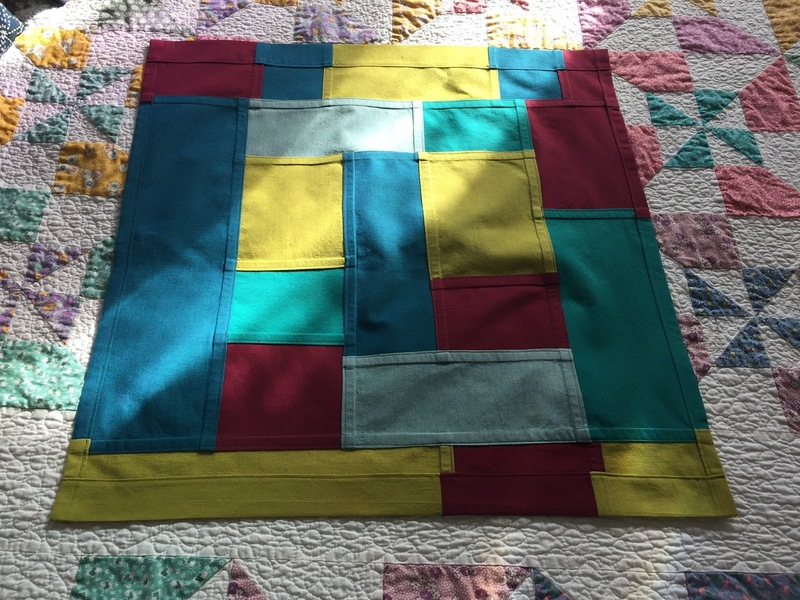 My niece lives in Vermont and showed me some cute photos on Pinterest (where else) of pillows made in the shape of states. Since Vermont was where this romance began it seemed only fitting. Her colors were grey and green/blue. 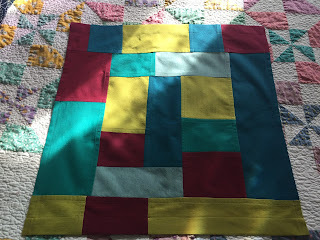 I used several shades of silk dupioni and stitched squares together and then attached the whole piece to fusible fleece. I traced a sugar maple leaf (from the Vermont State tree) on paper and stitched around it by machine. 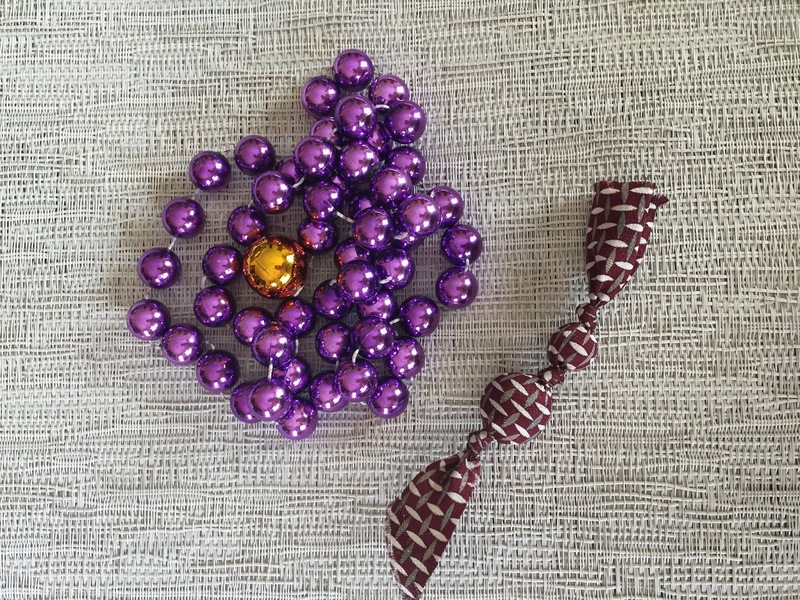 Using this as my pattern I then stitched around it with green embroidery floss. My trusty Bernina lettering stitches came in handy for adding the names of the bride and groom and date of the wedding. I also added a handle to the back for easy carrying (not shown in this photo). I stitched the 2 pieces together and then lightly stuffed the pillow with fiberfill to give it some body. The completed pillow and coordinating garter. The mother-of-pearl heart button marks the city where they had their first date and subsequent proposal. The handsome ring bearer and his assistants. He did a great job. My niece is getting married this fall and she decided the last thing she wanted to worry about on her big day was her shoes. 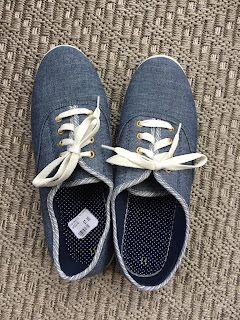 Comfort was her main objective and she found a cute pair of Dr. Scholl's that fit the bill. I got to do the decorating and it was great fun! I started with some stretch lace which I wrapped around the shoe. Glues of the trade. Of course as a seamstress I couldn't resist a little hand sewing, just to reinforce. My working conditions - a lovely sunny windowsill for the glue to dry. The pins helped hold things in place. Every bride needs a sixpence in her left shoe for good luck. so that it would show up but not be too obvious. The finished product, in it's own clear "glass" shoebox. 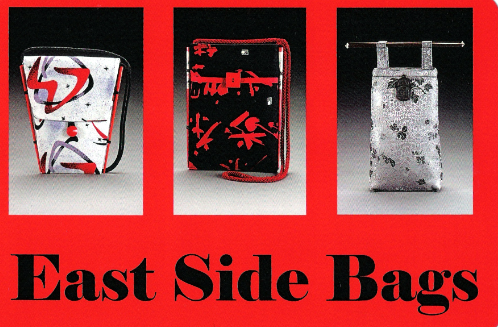 A blog that started out about East Side Bags and then grew to include all the fashion & fiber-related things that I love and wanted to document.